The new 718 GTS models are the embodiment of forward thrust -- even when stationary. Thanks to a sharpened design language and accents in black. The rear is clearly contoured and looks wide and imposing due to the rear apron and the centrally positioned sports tailpipes in black. The LED taillights are tinted, the model logo is also finished in black. The high-powered 2.5-litre turbocharged and horizontally opposed cylinder engine with direct fuel injection (DFI), VarioCam Plus and integrated dry-sump lubrication delivers a mighty 269 kW (365 hp) to the road. Top speed isn't reached until 290 km/h. The dash from 0 to 100 km/h is quite remarkable, too: with the 6-speed manual transmission, the new 718 GTS models complete the sprint in a mere 4.6 seconds. And it gets sportier still: with Launch Control of the Sport Chrono Package and Porsche Doppelkupplung (PDK), the clock stops after just 4.1 seconds. The 718 GTS models are fitted with a turbocharger engineered specifically for the respective power output of the engine, boosting performance and efficiency thanks to a modified compression system. Technology taken from the 911 Turbo helps to achieve excellent responsiveness at low engine speeds and a high maximum power output. With the sports exhaust system, the powerful sound of the mid-mounted engine becomes even more intense -- at the push of a button. The centrally positioned two-tract sports tailpipes in stainless steel are finished in high-gloss black. The large air intakes help to ensure an optimum supply of air. And they also make the front look even wider and more imposing. This impression is reinforced by the tinted front light units, the front spoiler and the outer air blades in black. The outlook is bright thanks to the Bi-Xenon main headlights. Optional LED main headlights including Porsche Dynamic Light System Plus (PDLS Plus) offer excellent safety combined with a sporty design. 20-inch Carrera S wheels with a dynamic 10-spoke design help to ensure solid road holding. They are -- typically for a GTS -- finished in satin black. A selection of other 20-inch wheels is available from our range of personalization options. The interior integrates the driver perfectly into the vehicle. All the important information you need is directly within view. Alcantara(R), the proven motorsport material, ensures a good grip. In the new 718 GTS models, it is used primarily for surfaces within close reach: such as on the steering wheel rim and gear lever/ selector. Sports seats Plus help to create the seating sensation typical of a sports car. The special part? The combination of leather and Alcantara(R) and a striking seam pattern. The seat centers are in Alcantara(R) and the headrests are embroidered with 'GTS' logos. Sports bucket seats are available as an option for an even more authentic motorsport feel. The Sport Chrono Package enables an even sportier tuning of the chassis, engine and transmission. And launches you to unprecedented sporty heights. Besides the four selectable performance modes available from the GT sports steering wheel, the Sport Chrono Package offers additional functions in conjunction with PDK -- for maximum responsiveness and maximum acceleration. The Sport Chrono Package also includes the Porsche Track Precision app. In conjunction with Connect Plus of Porsche Connect, you can clock lap times, collate driving stats, manage the results and share them with others for comparison. 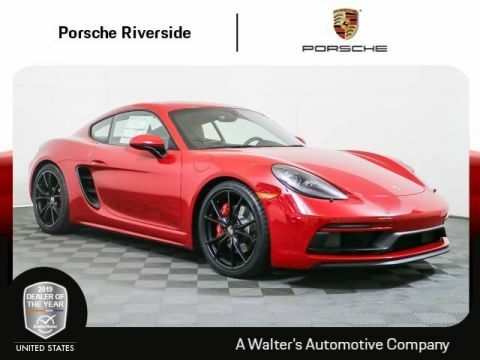 This Porsche 718 Cayman GTS has the following options: 30 PASM Sport Suspension (20 mm Lower) 0L Carmine Red 250 Porsche Doppelkupplung (PDK) 457 Lane Change Assist (LCA) 497 Preparation Rear Model Designation Painted 541 Seat ventilation 581 Luggage net in passenger footwell 583 Smoking package 625 Porsche Entry & Drive 658 Power Steering Plus 714 Deletion of Alcantara? 7UG Navigation Module for Porsche Communication Management (PCM) 858 GT Sport Steering Wheel in Leather 9VL Bose Surround Sound System AJ Standard Interior i.c.w. 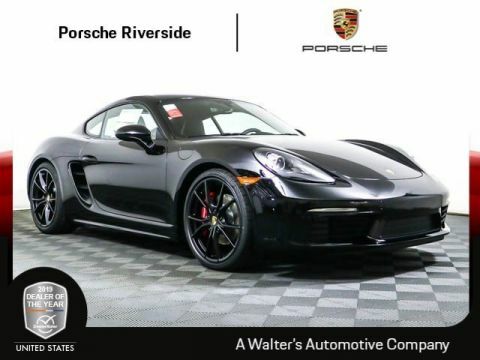 Leather Sport Seats Plus, Black CUC Model Designation Painted IV2 Porsche Connect Plus P07 Adaptive Sport Seats Plus (18-way) with Memory Package P9C Premium Package (Adaptive Sport Seats Plus, 18-way) XEW Bi-Xenon Headlights in Black incl. Porsche Dynamic Light System (PDLS) Let the 2018 Porsche 718 Cayman GTS impress you in person today at Porsche of Riverside located at 8423 Indiana Ave. Riverside, CA 92504.Price plus government fees and taxes, any finance charges, any dealer document processing charge, any electronic filing charge and any emission testing charge. Prices and offers on inventory expire each night at midnight. The new 718 GTS models are the embodiment of forward thrust -- even when stationary. Thanks to a sharpened design language and accents in black. The rear is clearly contoured and looks wide and imposing due to the rear apron and the centrally positioned sports tailpipes in black. The LED taillights are tinted, the model logo is also finished in black. The high-powered 2.5-litre turbocharged and horizontally opposed cylinder engine with direct fuel injection (DFI), VarioCam Plus and integrated dry-sump lubrication delivers a mighty 269 kW (365 hp) to the road. Top speed isn't reached until 290 km/h. The dash from 0 to 100 km/h is quite remarkable, too: with the 6-speed manual transmission, the new 718 GTS models complete the sprint in a mere 4.6 seconds. And it gets sportier still: with Launch Control of the Sport Chrono Package and Porsche Doppelkupplung (PDK), the clock stops after just 4.1 seconds. The 718 GTS models are fitted with a turbocharger engineered specifically for the respective power output of the engine, boosting performance and efficiency thanks to a modified compression system. Technology taken from the 911 Turbo helps to achieve excellent responsiveness at low engine speeds and a high maximum power output. With the sports exhaust system, the powerful sound of the mid-mounted engine becomes even more intense -- at the push of a button. The centrally positioned two-tract sports tailpipes in stainless steel are finished in high-gloss black. The large air intakes help to ensure an optimum supply of air. And they also make the front look even wider and more imposing. This impression is reinforced by the tinted front light units, the front spoiler and the outer air blades in black. The outlook is bright thanks to the Bi-Xenon main headlights. Optional LED main headlights including Porsche Dynamic Light System Plus (PDLS Plus) offer excellent safety combined with a sporty design. 20-inch Carrera S wheels with a dynamic 10-spoke design help to ensure solid road holding. They are -- typically for a GTS -- finished in satin black. A selection of other 20-inch wheels is available from our range of personalization options. The interior integrates the driver perfectly into the vehicle. All the important information you need is directly within view. Alcantara(R), the proven motorsport material, ensures a good grip. In the new 718 GTS models, it is used primarily for surfaces within close reach: such as on the steering wheel rim and gear lever/ selector. Sports seats Plus help to create the seating sensation typical of a sports car. The special part? The combination of leather and Alcantara(R) and a striking seam pattern. The seat centers are in Alcantara(R) and the headrests are embroidered with 'GTS' logos. Sports bucket seats are available as an option for an even more authentic motorsport feel. The Sport Chrono Package enables an even sportier tuning of the chassis, engine and transmission. And launches you to unprecedented sporty heights. Besides the four selectable performance modes available from the GT sports steering wheel, the Sport Chrono Package offers additional functions in conjunction with PDK -- for maximum responsiveness and maximum acceleration. The Sport Chrono Package also includes the Porsche Track Precision app. In conjunction with Connect Plus of Porsche Connect, you can clock lap times, collate driving stats, manage the results and share them with others for comparison. This Porsche 718 Cayman GTS has the following options:030 PASM Sport Suspension (Lowered 20 mm)24931 Preparation for Exterior Paint to Sample250 Porsche Doppelkupplung (PDK)489 Heated Multifunction Steering Wheel581 Luggage net in passenger footwell583 Smoking package658 Power Steering Plus789 Preparation for Exterior Paint to Sample98 Exterior in Custom Color, Non-Metallic9VL Bose(R) Surround Sound SystemEFA Pedals and footrest in AluminumEKH Interior Trim in Carbon Fiber i.c.w. Standard InteriorGF Standard Interior in Black Leather/Alcantara(R) with Alcantara(R) Seat CentersIU2 Porsche ConnectP07 Adaptive Sport Seats Plus (18-way) with Memory PackageP9C Premium Package (Adaptive Sport Seats Plus, 18-way)XEW Bi-Xenon Headlights in Black incl. 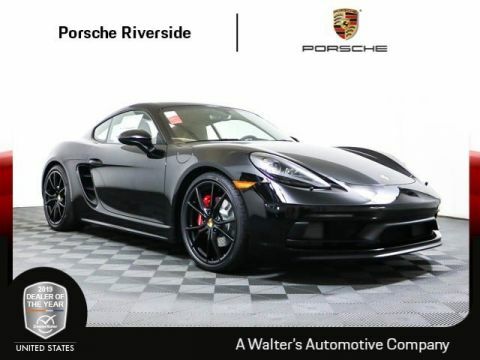 Porsche Dynamic Light System (PDLS)XXD Door Sill Guards in Carbon Fiber, Illuminated Let the 2018 Porsche 718 Cayman GTS impress you in person today at Walter's Porsche Riverside located at 8423 Indiana Ave. Riverside, CA 92504.Price plus government fees and taxes, any finance charges, any dealer document processing charge, any electronic filing charge and any emission testing charge. Prices and offers on inventory expire each night at midnight. A descendent of the popular Porsche Cayman, the Porsche 718 Cayman lets its sporty actions do the talking and is currently available at our Los Angeles area dealership – Porsche Riverside. This corner-devouring coupe doesn’t simply carry on where the 718 GTR Coupe left off; it seeks to piece together a legend of its own. What makes the 718 Cayman so special? Its mid-engine design. And while we’re speaking of special, check out our current Porsche Cayman lease specials. The coupe’s mid-engine layout provides dynamic cornering capabilities, a reduction in oscillations resulting in a smoother driving experience, and concentrated power transmitted directly to the rear axle. Its layout gives way to two luggage compartments that provide generous amounts of space to take advantage of. The Cayman is offered in the 718 Cayman and the 718 Cayman S trim levels. 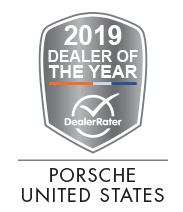 No matter which model is chosen, shoppers at our Porsche dealership in Riverside will find a cabin with a styling marked by intuitive handling, performance-oriented ergonomics, and a clean design. These models are fully geared for sporty performance. The driver-centric cockpit delivers a striking appearance and puts all of the controls at the driver’s fingertips. The sport steering wheel is derived from the 918 Spyder. The 718 Cayman is motorsport in its purest form. Learn more about the new 718 Cayman models when you visit our Porsche showroom in Riverside. 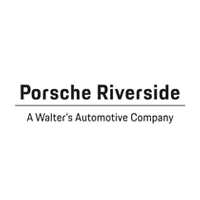 Contact Porsche Riverside to learn more about our current new Cayman inventory and offers.